How do I sell gold for cash online? No waiting for cheques to arrive or for payments to clear. At Post My Gold, we offer cash for your gold paid straight into your bank account within 24 hours of receiving your unwanted gold, platinum, palladium or silver. Our straightforward, secure, and expert service makes getting cash for your gold quick and easy. Once you send us your contact details, we will post your FREE Gold Pack straight to your door. Send us your gold in the fully insured Gold Pack, along with the completed form. Our expert team will immediately assess your gold and we will contact you with our best offer within 24 hours of seeing your gold. 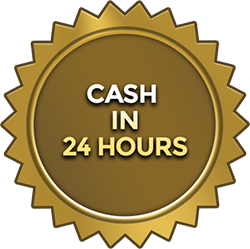 If you accept that offer, we will ask you for your bank details and pay cash for your gold directly into your account within 24 hours. Your confidence and security are important to us which is why we not only provide secure postage, but also the safest form of payment. Sending cash by bank transfer is a secure method. Your cash will arrive quickly, securely, and without hassle.